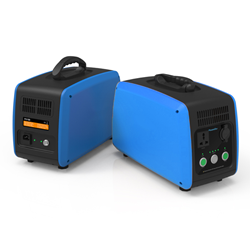 Larson Electronics, a leading manufacturer and supplier of industrial grade lighting solutions, has released a new series of portable battery packs powered with lithium-ion batteries that offer multiple charging capabilities. These units can be used to power a wide range of heavy duty tools and equipment, including laptops, portable machines, and mobile devices. These battery packs are powered by lithium ion batteries with a Samsung ICR18650-3.7V-2600mAh cell. These units are designed for off-grid use in remote locations with solar panel compatibility (Escape 30, Boulder 15, Nomad 27, and Nomad 13). These solar units are available in a 300 watt rated output, a 2,000 watt rated output, and a 500 watt rated output. The units come with versatile AC and PV charging options and can be charged by a wall charger, a car charger, and solar charger. A digital panel displays the status of the battery in real-time. For seamless transportation and handling, a pop-up handle may be deployed. The battery pack supports 120/240 volts AC output voltages and frequencies. A Type G AC output socket/charging cable is supported by this unit. This product can be charged using solar panels (PV) with a max input voltage of 150Vdc and MPPT input voltage of 18~50 volts DC. The portable battery pack weighs 26.4 pounds and measures 15.9 x 8.4 x 10.2 inches, making it easy to carry from one location to another. Larson Electronics carries an extensive line of LED light towers, portable power distribution systems, explosion proof lights, portable work lights and industrial grade LED area lights. You can view Larson Electronics’ entire line of lighting by visiting them on the web at Larsonelectronics.com. You can also call 1-800-369-6671 to learn more or call 1-214-616-6180 for international inquiries.